Following the Paris shootings, thousands of Muslims all over France and abroad took to the streets, to distribute flowers and carry anti-terrorism banners, saying their religion had nothing to do with the Islamists' attacks. 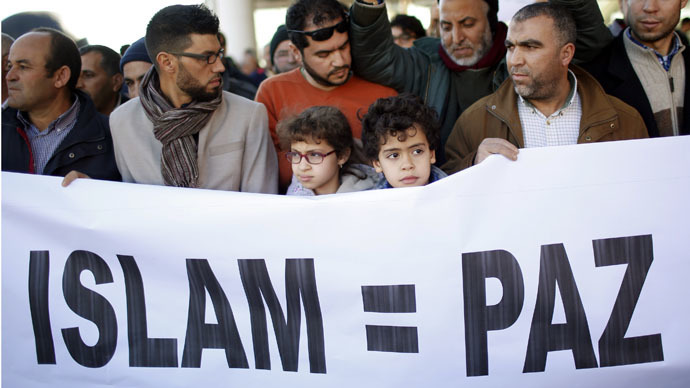 Muslims are against religious extremism, said the banner carried by members of the Muslim community in Marseille, southern France, as they gathered for a rally to express sympathy and solidarity with the victims of the Paris shootings that left 17 people dead. Social media users posted photos of Muslim kids with posters against extremism. “I’m Muslim, but I am not a terrorist. Long live France! Long live the Republic!” said a placard, carried by a small boy in the streets of Nancy, in northeast France. A group of Muslims give out white roses to the crowd of participants in the Paris Unity march Sunday. "I am French, Muslim and against terrorism," said a banner carried by the members of French Muslim community during the Unity March in Paris. Islam is supported by the pigeons of peace, tolerance, love and respect, said a banner held by a girl from the Muslim community of Madrid outside the city's Atocha train station. The Paris shootings were strongly condemned by Madrid's Muslims. "All joined against terrorism. Islam=Peace," said the posters they carried. Hundreds of Muslims joined the rally to sympathize with the victims of the Charlie Hebdo massacre and the three days of terror in Paris. Along with the symbolic #JeSuisCharlie ("I am Charlie") hashtag, Muslims also tweeted #NotInMyName, which was previously used by Muslims to condemn the atrocities perpetrated by Islamic State militants. Following the shootings in France the hashtag has come back into the spotlight. An imam in Bordeaux, southwest France, Muslim theologian Tareq Oubrou, said that Muslims are furious that Islam has been "confiscated by crazies... and uneducated, unbalanced people."